‘Be at the Top of Your Game’ for sports fans or for people involved in sports, this immortal phrase is often roared in dressing rooms across the globe. For most sportspeople to be at the top of their game involves a monumental feat in preparing both mentally and physically. To achieve success in sport regardless of your talent, requires in-depth planning, preparation and training. More importantly they will require guidance, structure and a direction. Managers of individual sports athletes or teams will employ a strategy or tactic to counteract an opponent to gain a victory. Sports managers will often gather in-depth information and knowledge of their opponents as they realise that not every team or player is the same. Preparation and employing a strategy at this level will ensure a team or an athlete will have the confidence to compete at the highest level. As a Digital Marketing Agency we feel that when examining your Social Media Marketing the same principles as in the above sports analogy applies. No business or brand is successful without having a plan or strategy. Before your market your brand on Social Media, create a strategy that will give you a direction. In addition deliver a tactic to achieve success in building brand awareness. It crucial to remember no two Social Media Marketing strategies are the same. As a brand you have got to ask yourself ‘What is unique about my proposition’ and establish your brand position. Then look for the gaps in the market where you can tailor your Social Media Marketing strategy to exploit those gaps and build brand exposure. Demographics – Research who your audience is, where they are, age profile, when they are most active, their interests, their preferences and who you are trying to target. Identify Social Media Channels – It important to investigate what Social Media channels best suit your marketing objectives. For example if you’re a B2B brand, Twitter and LinkedIn is the preferred channel to find and engage with potential customers. For B2C brands Facebook and Twitter is a popular way to engage with customers and build brand awareness. If you are a fashion or an online retailer, using visual content on Pinterest is a great way to drive traffic to your website and convert into sales. Create goals and objectives – For any business or brand its vital to set out from the start what you want to achieve and how you will achieve it. Setting goals is great mechanism to motivate and focus your efforts to achieve success on Social Media. Set realistic and achievable goals e.g. new followers/fans, brand reach, level of engagement, new product introduction, number of click-throughs etc. 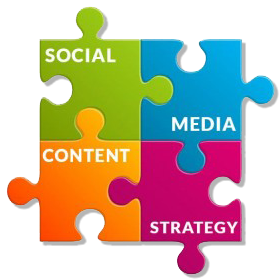 Content – Central to building brand awareness on Social Media is creating content that engages your audience. Social Media is the only marketing platform that enables brands to engage with customers on a human level. Ensure that your Content reflects your brand and engage on human level with your audience. Content Planner – Preparation is key to success whether it is sport or business. Whether you’re are running a brand campaign or taking part in an event, planning your Social Media Marketing activities in advance provides structure and focus. This helps to increase the chances of succeeding in your marketing goals. Planning your content in advance helps to save time and enables you to create high quality content that your Social Media audience will engage with. Measure KPI’s (Key Performance Indicators) – To measure the progress of your marketing goals, you need to clarify what KPI’s you are going to employ. In terms of Social Media Marketing KPI’s can include level of engagement, new likes/followers, shares, click-throughs, new leads, reach, brand impressions etc. Once you have identified and analysed your KPI’s use the results to improve your marketing efforts. A successful Social Media Marketing strategy isn’t achieved instantaneously. Examine what tactics work and what doesn’t. Remember prepare, plan and implement to be at the top of your game! To learn how New World Digital can help you be the top of your game online simply Contact Us by filling out the form or call one of the numbers at the top.